Editor’s note: This post first appeared in a longer article in the June 9 issue of SOLUTIONS, the monthly e-newsletter from Home Health Solutions LLC. Click here if you’d like to subscribe to SOLUTIONS. Summertime, and the livin’ is easy. Unless, of course, you’re in the home health field. From backyard barbecues to long and lazy afternoons at the beach, this is the time of year when leisure time is foremost in our hearts and minds. But this summer, smart home health agencies are looking beyond the distractions of summer to the fall, when the change of season will usher in a new round of major adjustments. Home health agencies in Illinois won’t even have to wait until fall; the Centers for Medicare and Medicaid Services (CMS) announced last week that it will move forward with preauthorization requirements despite opposition from the home health industry. CMS will roll out the first preauthorization program in Illinois Aug. 1. Four more states will follow throughout the fall and winter, with Florida scheduled for Oct. 1, Texas for Dec. 1, and both Michigan and Massachusetts for Jan. 1. Rollouts in those states will require home health agencies to perform prior authorization before processing claims for services. The procedure would be similar to the Prior Authorization of Power Mobility Device (PMD) Demonstration, which CMS implemented in 2012. It requires prior authorization for scooters and power wheelchairs within seven states where fraud and errors have been prevalent in the past. Nationwide, this autumn was already shaping up to bring a round of new challenges to home health agencies. In October, when CMS removes a three-year partial code freeze, some 2,500 changes are expected to become part of the ICD-10-CM classification set. At least 1,900 new codes will be added, 351 codes will be revised and 313 codes will be deleted. The tabular list will change as well. A few Excludes Notes will shift and some others will disappear completely in this first reworking of the code set since its implementation at the start of 2016. Exactly how these changes in codes will impact the home health field still isn’t clear, as the complete list of revisions has not yet been provided. Be prepared; coding guidelines are likely to change frequently during the adaptation process to the revisions. Guidelines already change so often with new interpretations that it can be difficult for coders to keep pace. Major re-interpretations just in the past couple of months had coders scrambling this spring to rethink the way diagnoses and comorbidities can now be linked, and how certain heart failure diagnoses can now be coded without further specification by the attending physician. Many areas of ICD-10 implemented this year have given rise to questions, and as those issues are reviewed and addressed, coding guidance will continue to evolve rapidly with new interpretations and even reversals. It is crucial for agencies and the coders they employ to stay abreast of every change to reduce compliance risks. And the changes in the ICD-10 set are just Round 1. On the heels of those changes, the Outcome and Assessment Set generally known by its acronym, OASIS, will undergo its own revisions. OASIS C-2 is scheduled for implementation Jan. 1, 2017, and will add new items, renumber some items, and make other changes in how data is collected. How can home health agencies and home health coders prepare for all these major changes beginning Aug.1 and continuing through early 2017? “There’s never been a more critical time to shore up your agency’s operation,” advises J’non Griffin, owner of Home Health Solutions LLC. Addressing and correcting existing compliance risks this summer will better position agencies to handle problems likely to occur during the adaptation process in the fall, reduce the likelihood of home health professionals feeling overwhelmed by constant change, and provide an extra layer of insulation against potential losses due to claims denials, according to J’non. She recommends agencies prioritize internal audits, quality reviews and other self-assessment measures between now and Labor Day. “This summer is the time for agencies to take a proactive approach, identifying and addressing the need for quality clinical documentation and code specificity – and then follow up with extra training measures and education efforts in every area where there is any confusion or performance issue,” she says. In many cases, it may prove more cost-effective and time-expedient for agencies to streamline operations by partnering with a consultant to develop and implement corrective measures, or to outsource some services. 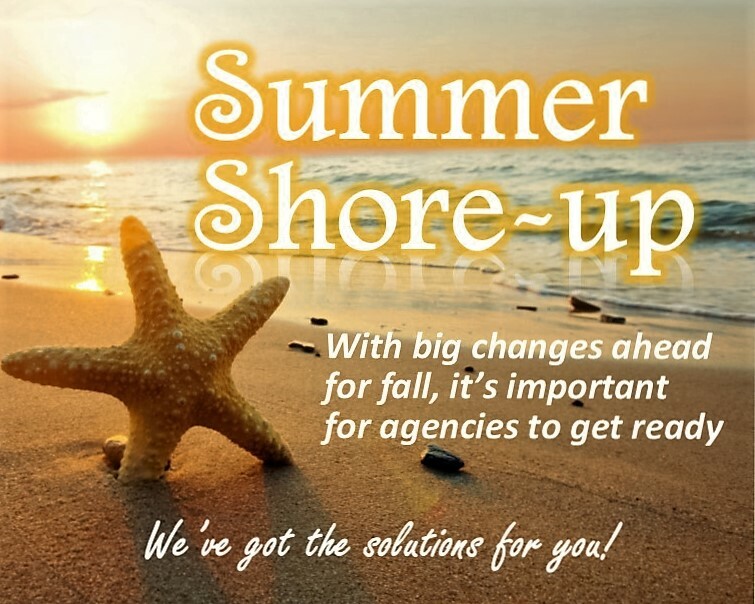 Home Health Solutions is making it easier than ever to get help with a Summer Shore-Up Package, offering limited-time discounts on new services. 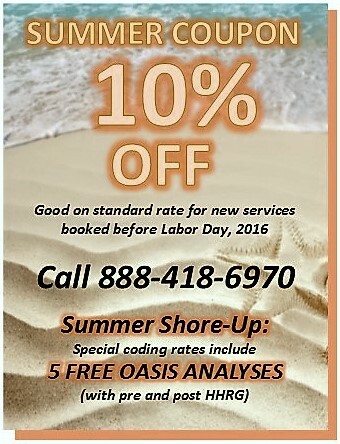 Now through Labor Day, the Summer Shore-Up Package from HHS will offer a 10 percent discount off any standard rate of new services. In addition, agencies contracting for coding services under the Summer Shore-Up Package will receive 5 free OASIS analyses with pre and post-HHRG (Human Health Resource Group) values.